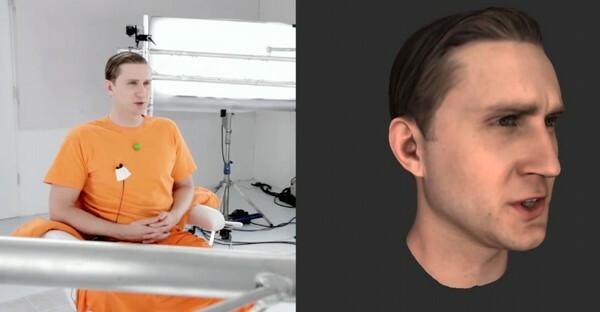 High-quality facial motion capture for filmmaking (e.g., Rise of the Planet of the Apes, Avatar, TRON: Legacy) is usually done with a combination of visible marker dots and a head-mounted rig (on-set) and the MOVA Contour system of phosphorescent makeup (off-set). There’ll be a longer blog post on this later, but the video below from Digital Domain on the de-aging effect of Jeff Bridges in TRON: Legacy illustrates the idea. However, video game developer Team Bondi took a different approach for their 2011 video game L.A. Noire. 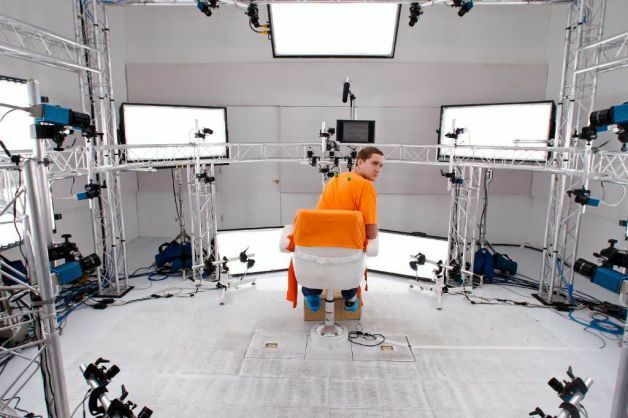 They created a custom multi-view stereo environment, pictured below, to capture the 3D face and hair of a large number of performers, which was later compressed and streamed directly into the game. I started playing it last night and the effect is really striking! The below video explains the process in more detail with many examples from the game. The technology, called MotionScan, was created by a company called Depth Analysis. Unfortunately, Team Bondi is no longer around and it remains to be seen whether this approach will resurface in a new game or movie.